Here’s our full video preview, if you’re on our mailing list to get your free 2017 Bull Book you’ll also be receiving this in full length DVD. Bull buying made easy… We’ve been in this business for years and we’ve learned a few things along the way. Most important… you don’t last unless you do right by your customers. We’ve made bull buying a whole lot easier. Our bulls are good quality, all of them, well culled, they’re easy keeping, good looking, durable bulls that sire those “fancy calves the order buyers keep talking about.” Our bulls are older fall and summer born twos (22-26 months when you need them), old enough to be tough and not give trouble. Our bulls can all be left with us till spring, you don’t want new bulls around till you need them, so let us look after them. 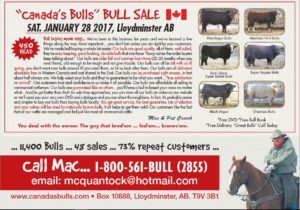 Our bulls are all delivered absolutely free in Western Canada and cost shared in the East. Our bulls can be purchased sight unseen, in fact about half always are. We help select your bulls and they’re guaranteed to be what you want…”true satisfaction on arrival”. Our customers trust and confidence in us make it all possible. Our bulls are affordable all selling to commercial cattlemen. Our bulls are guaranteed like no others…you’ll have a bull to breed your cows no matter what…hard to get better than that! As sale time approaches, you can view all our bulls on video on our website or we’ll send you your very own DVD and catalogue and you can show the neighbors. In fact, it’s probably easier and simpler to buy our bulls than buying bulls locally. You get great service, the best guarantee, lots of selection and your calves will be sired by nationally known bulls. It all helps to get them sold! Our customers like the fact that all our cattle are managed and fed just like most all commercial cattle.